With Sniper: Ghost Warrior 3, CI Games say they’re making the first AAA game in the series. And since it’s 2015, that means it’s also an open world game with crafting and fast travel and pretty trees. Here, watch 24 minutes of a man being a Sniper Ghost Warrior while another man talks about the game. So the titular Sniper Ghost Warrior, who is not actually a vengeful spirit, is wandering around Georgia, murdering people with his gun. He’s doing illegal things, the scoundrel. It’s evocative of Far Cry, but with a much stronger focus on stealth and tactics, and obviously a lot more sniping. The Sniper man might be Batman or a Witcher, and can see glowing footprints, mines and things that might lead to side quests. These side quests are not called side quests, however, and you will have to call them war crimes, which is a lot more important than a quest. It all gets very exciting at the end, with Sniper Ghost Warrior fleeing enemy gun fire after completing his mission. He gets to heroically jump into a helicopter and fly away to safety. At that moment the developer explains that this will never actually happen in the game, it’s just what they are doing to wrap up the demo. This is a terrible shame. 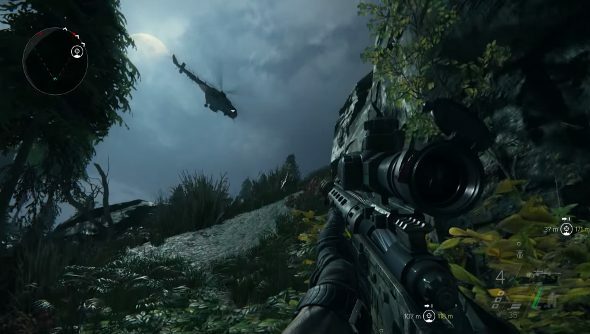 Sniper: Ghost Warrior 3 is due out in 2016.